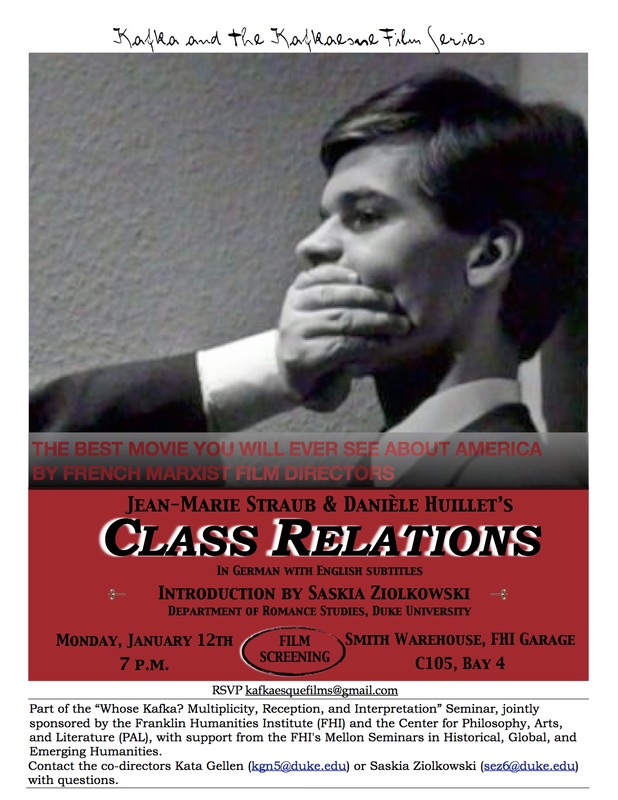 All films will be shown on Mondays at 7pm in the FHI Garage, Smith Warehouse Bay 4, Duke University. Please rsvp to kafkaesquefilms@gmail.com. 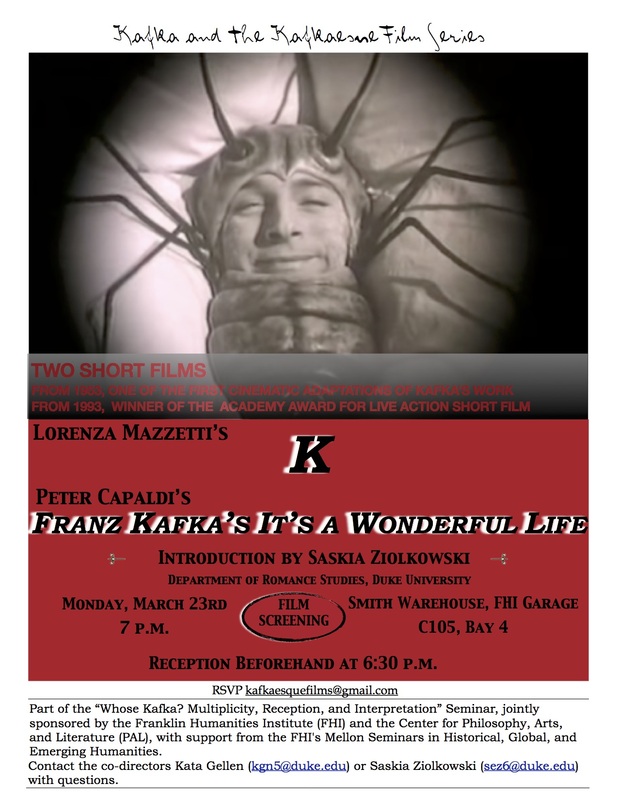 On Monday, March 23rd at 7:00 p.m. in the FHI Garage we will be screening two short films: K (1953) directed Lorenza Mazzetti, a founder of Free Cinema, and Franz Kafka’s It’s a Wonderful Life (1993) directed by Peter Capaldi and winner of the Academy Award for Live Action Short Film. 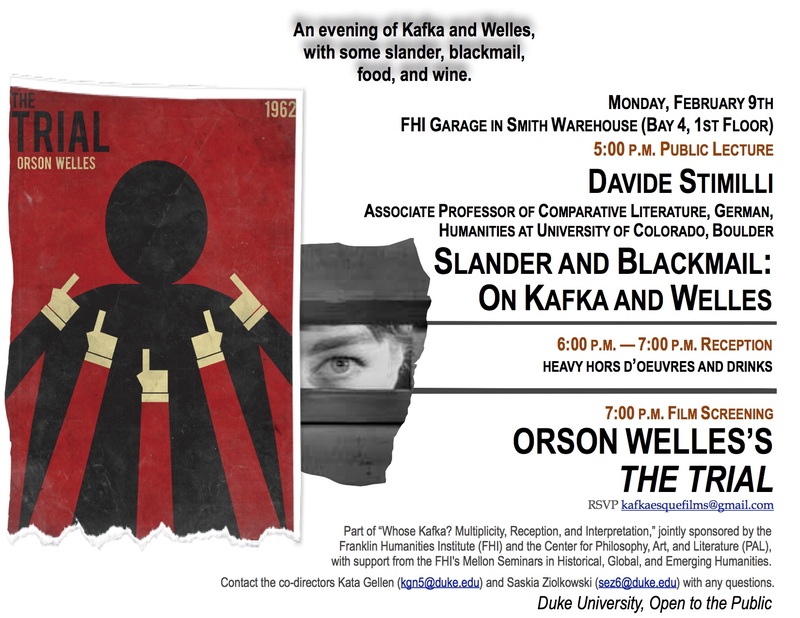 Reception beforehand at 6:30 p.m.
Michael Valdez Moses will be introducing a special screening of Steven Soderbergh’s 1991 cult film, Kafka, which will be shown tonight, October 6 at 7 pm at Duke in the Smith Warehouse, FHI (Franklin Humanities Institute) Garage, C105, Bay 4. In the years since its release, Kafka has become an underground classic: an important early work by a leading independent American film director that has never been released in the U.S. on DVD or BRD. Heavily influenced by American film noir and German Expressionist silent cinema of the ’20s, it was shot in Prague (shortly after the fall of the communist government) and features some truly amazing black-and-white cinematography. Martin Scorsese pushed to have the film released in the United States and the playful 1987 film is full of references to Fellini’s previous works, such as La dolce vita and 8 1/2. It also portrays Fellini realizing his unrealized dream of adapting Kafka’s Amerika, or The Man who Disappeared, to the screen. RSVP to kafkaesquefilms@gmail.com.